Like many another country operator, this family business had its origins in 1920 when Alec House started with a horse drawn van in the mid-Dorset village of Hilton. Mid Dorset Coaches was later to become their very appropriate fleet name. The first motor bus (a Wilson) was acquired in 1923 and could be seen delivering coal when not carrying passengers. Sometimes bags of coal were sold from the back door of the bus as it returned from Dorchester with passengers. In 1928 a Dennis 14-seater replaced the original Wilson. The fleet alternated in size between one and two vehicles until after the end of the second world war. By the early 1950s there were three and even in the 1970s the fleet size was only to rise to half a dozen, although Bedford constantly remained the manufacturer of choice. Alec House died in 1945 at the early age of 49 and by the year 1947 the business was being run by his widow Mrs Violet House, and this was so through the 1950s and 1960s. Then in 1968 Alec's three sons Norman, Mervyn and Maurice - then aged 44, 43 and 35 respectively - assumed the operation of the business as a partnership. The work was a mix of school contract, private hire and stage service work. 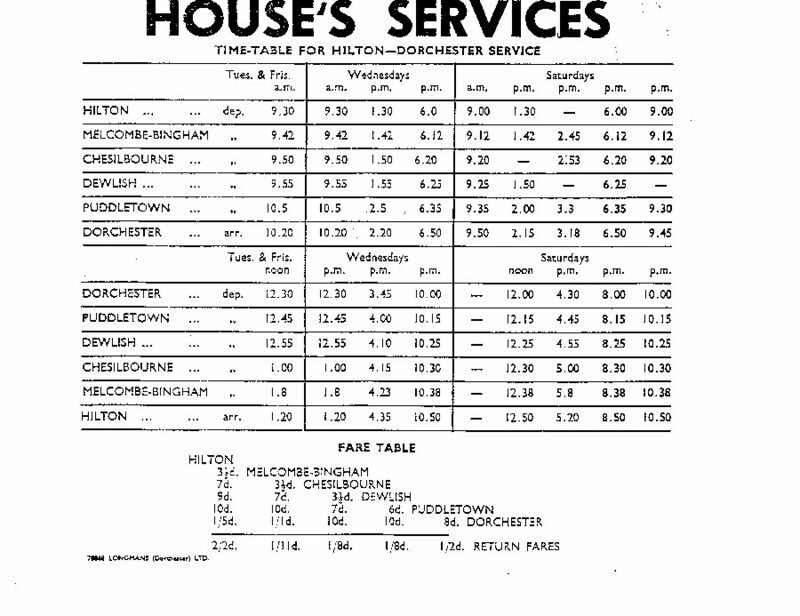 The most important route was that between Hilton and Dorchester, originally run four days a week but expanded to six days a week in the 1960s. Originating in Hilton the route went up to Ansty Cross, with some journeys double running a half mile to and from Higher Ansty. Then down past the Fox Inn and the site of the original Hall & Woodhouse brewery and on through the lanes to serve Melcombe Bingham and Cheselbourne. Originally the route then ran direct to Puddletown but it was later diverted to include the village of Dewlish. (L Cutler was the original operator between Dewlish and Dorchester three days a week. He sold his business to B Stone of Dewlish in 1948. It changed hands again, this time to H Butler of Milborne St Andrew in 1951. Butler transferred the stage service operation to House in 1953. Interestingly Mr Butler drove part-time for the House's for some years after giving up his own coaching business altogether a few years later). From Puddletown the route went west along the A35 to Dorchester and terminated in the Council Yard in Trinity Street, the favourite haunt of the independent bus in the county town for many, many years. A little surprisingly perhaps the home village of Hilton was never a significant provider of passengers, who tended rather to come from the other villages along the route. There was also a Thursday market service to Blandford. Eggs to market was an important feature of this service for many years, as well as taking the people! The route circumscribed the heights of Bulbarrow, up hill and down dale, leaving Hilton and Ansty to the north west to serve the populous village of Hazelbury Bryan. Then turning east through Woolland and Ibberton to Okeford Fitzpaine, joining the A357 through Shillingstone to Blandford Forum. This was always a popular run with passengers and often required duplication, especially in the summer school holidays. I have many fond memories of passing a pleasant hour in conversation with Mervyn and Maurice in the Hams coach park at Blandford when I worked at Stanbridge, after I had driven the market bus in from Witchampton and Crichel. Indeed it is Mervyn, when living in retirement in Hilton, who told me much of what I know about Dorset and its buses, for which I shall always be grateful. Before the war there had also been a Monday market bus fortnightly from Hilton to Sturminster Newton travelling via Ansty and Hazelbury Bryan, but this was never as successful as the Blandford service and did not operate post-war. It was the least patronised route but it was something to do with the bus on a quiet day! Always keen followers of the Bedford, the fleet comprised six vehicles in 1968, three OB's and 3 SB's, all with Duple bodies. The three OB's were DJT376, a 1949 29-seater which came to Hilton in 1958. LTA904 was another 1949 vintage 27-seater which arrived in 1960, and in 1963 the trio was completed by the arrival of JBY800, a 1947 29-seater. As to the SB's, there was HDL752, a 1951 33-seater which joined the fleet in 1963; followed in 1965 by YTD760, a 1954 38-seater. And the largest coach in the fleet at the time was the last SB, 6149NX, dating from 1960, a 41-seater which had come to Mid-Dorset Coaches in 1966. (An interesting earlier non-Bedford vehicle was RV6946, a Dennis Ace 20-seater, with a small protruding snout-like bonnet, which was sold to Crabb of Sydling in 1948. The Dennis had been bought new by House in 1935 from Sparshatts of Southampton, and had been the mainstay of their operations in the war years). 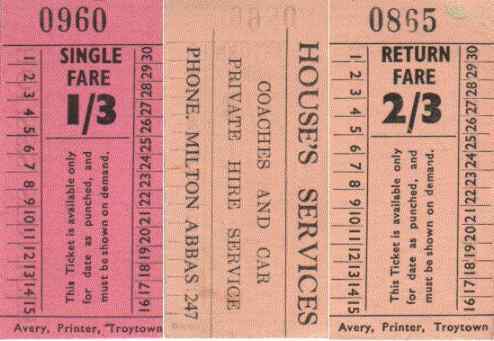 In 1970 the Wednesday and Saturday service to Dorchester was extended from Hilton back through the grounds of Milton Abbey School to start in the picture-book village of Milton Abbas. This was to provide a partial replacement after the cessation of the Bere Regis & District route between Winterbourne Stickland, Milton Abbas and Dorchester. A Bedford slumbers in Dorchester Council Yard before returning on the service to Hilton. 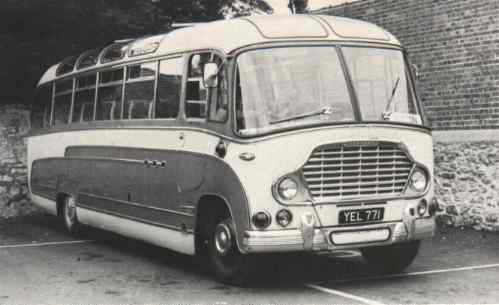 YEL771 came from Shamrock & Rambler Coaches of Bournemouth, and was driven by Mervyn House for many years. 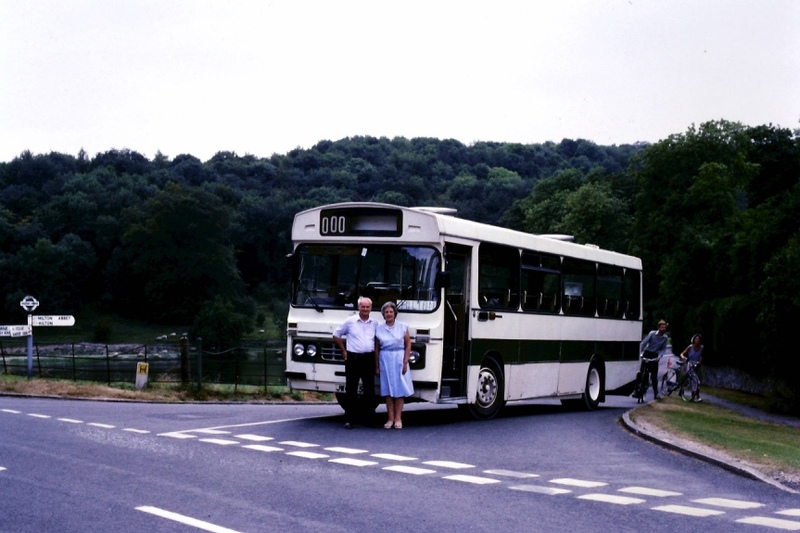 Subsequently Mervyn drove a Ford / Duple 45-seater JWC525N (see below) which passed to Bere Regis & District when the business closed by retirement in 1987. A purpose built garage was erected to house the fleet at Hilton in 1973, to replace an earlier corrugated iron affair. The first garage still stands to this day whereas the later one was dismantled to be replaced by a couple of houses. Unusually for many years there were often twice as many coaches in the fleet as there were drivers, because Norman, Mervyn and Maurice employed no full time drivers other than themselves! This was always a very friendly and approachable firm. As the three brothers reached retirement age, ill health made the time right for the business and three vehicles to be sold to Bere Regis and District on 1st September 1987. The two firms had worked in harmony for many years, even to the extent that the first morning service on the Dorchester route was operated by a Bere Regis vehicle in later years. The final days operations by House were recorded on video for the family and a celebration party was held to mark the event. The last day - Mervyn House stands in front of Ford / Duple Dominant JWC525N by the lake at Milton Abbas. This vehicle passed to Bere Regis & District with the closure of the House business and the retirement of the proprietors. Service over the Dorchester and Blandford routes continues, albeit somewhat changed. The routes have seen a succession of operators in recent years (including the Blandford Bus Company). Later they were run by the Wilts & Dorset subsidiary Damory Coaches, and incorporated in their routes 311 and 317. From 24th July 2017 however, after withdrawal of county council financial support, the operation of the ex-House routes was regrettably withdrawn totally. There are no buses in the villages now. Sadly we record the passing of both Maurice and Norman House in spring 2008, aged 76 and 84 respectively. In the war Norman served in the Somerset Regiment and helped escaping servicemen at Arnhem. Both are remembered for their courtesy and punctuality as drivers and transport operators. The House brothers at Hilton were cousins of Reg and Gordon House of Mercury Coaches who used to operate from Boscombe, Bournemouth until the 1990s; whilst Malcolm House of South Central Coaches of Dorchester was another cousin. Mervyn, the third brother, died on 5th May 2011 aged 85; a great character, always a twinkle in his eye.